Thanksgiving Day for Bible-believing Christians should be a joyous time of reflection and praise for all the blessings God has bestowed on us. In spite of the wickedness that rages at times, our Creator is “merciful and gracious, slow to anger, and abounding in mercy” (Psalm 103:8) and “makes His sun rise on the evil and on the good” (Matthew 5:45). No matter our circumstances, we must acknowledge that God has been so very good to each of us, and this day affords us the special opportunity to praise Him for “all His benefits” (Psalm 103:2). God has been so very good to each of us. Sadly, Thanksgiving in the United States has often been treated as just another holiday. Many families will gather and share a meal, and some will even pause long enough to express “thanks” to someone or something—perhaps even to God. But the original significance of this “holy” day has largely been lost in the current generation. Thanksgiving Day should be much more than football and turkey and family get-togethers. It’s a day to worship the One who created us and has blessed us every day of our lives. Yet the “god” worshipped and thanked by millions bears little resemblance to the holy, omnipotent, and sovereign Creator God described in Scripture. How people recognize and respond to the Creator makes all the difference! Here at ICR, we are deeply thankful for God’s abundant provision through believers like you. Your sacrificial gifts make our work possible, and your encouraging notes and intercessory prayers remind us that the “wiles of the devil” and the “fiery darts of the wicked one” will never triumph as long as we stay true to God’s Word (Ephesians 6:11, 16). We’re grateful for this special partnership because it keeps our ministry focused and strong as we move into new and exciting ventures. Work on our latest ministry project, the ICR Discovery Center for Science and Earth History, continues at a furious pace. At the time of this writing, the high-end digital projectors for the planetarium and lecture hall are being installed and tested, large 12′ × 12′ fossil replica tiles are being hung along the front façade facing busy Royal Lane, and a glorious 25-foot-tall stainless steel DNA sculpture is being cast. It will sparkle in the midst of a reflecting pool just outside the main entrance. The facility will be absolutely stunning and is sure to draw many visitors. Our major focus now is on the interior details. Every plant, animatronic creature, and display—down to the final textures and colors—is vetted against biblical and scientific data to ensure precision and accuracy. We’re also working closely with artists as they sculpt impressive exhibits out of concrete and with filmmakers as they craft thrilling visuals that will educate and inspire our guests. The Bible and science will come alive in ways never seen before! ICR has the scientific “muscle” and biblical commitment to reach the coming generations with the truth of creation. But we can’t do it without continued help from God’s people to finish this powerful initiative. 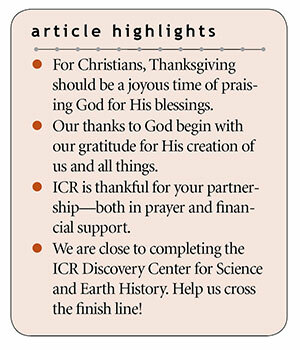 So this Thanksgiving, please prayerfully consider how you can “give thanks to the Lord” by partnering with ICR to “make known His deeds among the peoples” (Psalm 105:1). Our end goal is close. We only need a few million more to open this magnificent venue completely debt-free. By pulling together, we can build a lasting legacy that will reach far beyond our lifetimes and into eternity. ICR has the scientific muscle and biblical commitment to reach the coming generations with the truth of creation. From all of us at ICR, thank you again for your trust in us. May God richly bless you and your family as we praise Him for all He has done and will do. Happy Thanksgiving! Cite this article: Henry M. Morris IV. 2018. Beyond Thanksgiving. Acts & Facts. 47 (11).